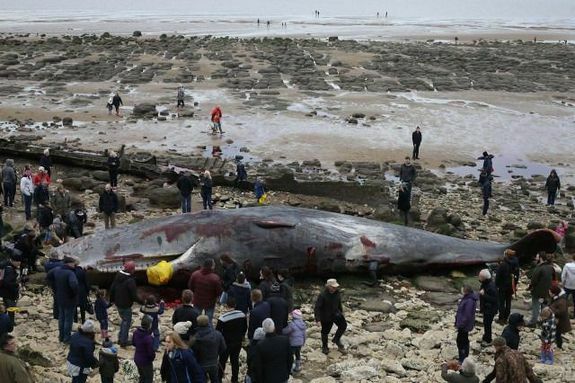 LONDON -- Three dead sperm whales that washed up on a beach near Skegness in Lincolnshire over the weekend are thought to be from the same pod as another whale that was found beached at Hunstanton on Friday. The pod was spotted off the coast of Norfolk before the whales were discovered on the coastal sands. Two were found on Saturday evening while the third was spotted on Sunday morning. 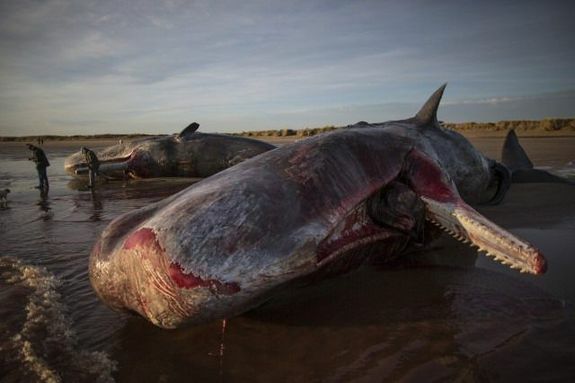 "All three are massive, beautiful animals, and it's just such a shame to see them on the beach in that way," James Gilbert from East Lindsey District Council said. The whales are thought to have been from the same pod as another animal that was found on Hunstanton beach in Norfolk on Friday. Members of the public have flocked to the beached sperm whales since they were discovered. A cordon was placed around two of the whales at Skegness. Local councils are checking with authorities to see if they want to examine the carcasses before they're removed. UK Coastguard's Richard Johnson said officials believe the whales died at sea before being washed ashore, adding that they "are expecting an officer from the Zoological Society of London to attend the scene and carry out tests on the whales." Scientists from the Cetacean Strandings Investigation Programme are set to carry out post-mortem exams as well. The Norfolk whale, which measured 50 feet (14.5 meters) in length, has attracted huge crowds and reportedly has its own security guards to stop people touching it or "scavenging" from its corpse. 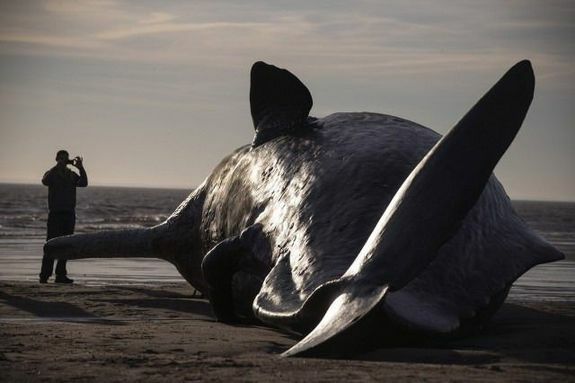 The dead 50ft (14.5m) young adult male sperm whale beached in Norfolk.